Throughout my almost 5 years here at IMPACT, I’ve seen a lot of (positive) change. A team of 15 is now over 60. A small office has become a big one. We’ve gone from having everyone work from our Wallingford location to now having more people working from their homes across the country. Learning how to properly manage a team is a big feat in itself. Add in the fact that half of my team works remote, and more challenges begin to pop up. The ease of walking over to their desks, grabbing a room to have a meeting together, or just wanting to take a lunchtime walk suddenly disappears. A team needs to be able to communicate strongly, report accurately, complete quality work based on documented goals and processes, and -- perhaps most important for remote employees -- feel like they’re all in it together. Nutcache’s infographic, “7 Tips for Managing a Remote Team,” (shared below) highlights helpful advice for managing a remote team in a way that ensures everyone is able to effectively complete work and interact successfully. I’ve always envied people who can be productive at home. (I often get sidetracked by Netflix or my dog…) This is part of the reason why working remotely is not for everyone. 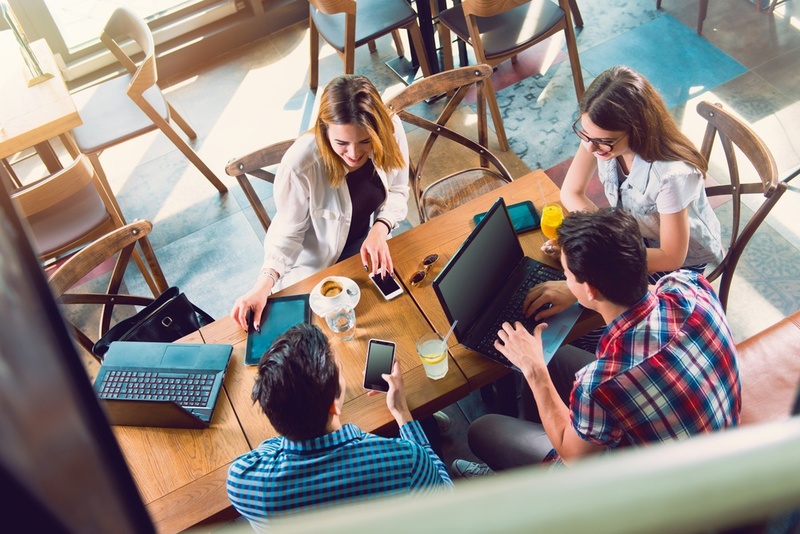 When opening up to remote employees, it’s important for your company to hire people who can thrive independently, as well as when working with their team. Imagine a business world without email, phone calls, instant messaging, and video/screen sharing. Having the ability to see my team’s faces everyday makes me feel connected to every single of them, and because we’re able to quickly communicate via video or instant messenger, we’re more productive and clear in what’s expected of each other. In addition to communication tools, project management tools are also essential. Having a software that the entire team can use from anywhere makes a world of difference when it comes to managing each person’s workload and knowing how that feeds into the team’s overall list of to-dos. Having company processes in place is important to keeping all teams consistent, so it’s imperative that everyone is familiar with and follows them. You may also want to develop specific processes for the people on your team that will help keep everyone on the same page when it comes to achieving your goals. Speaking of goals, it’s not only essential that you have them, but everyone on your team should also know exactly what you’re working towards, what the plan of action is to achieve them, and how your goals feed into the bigger objectives of the organization. Make sure you’re clearly communicating your team’s goals to each individual member on a consistent basis; talk about them in 1-on-1s, team meetings, and performance reviews. My team believes in always over-communicating. We use tools like Slack and Zoom to keep all lines open when we need help or things clarified. We have daily stand-up meetings each morning to ensure we’re all cognizant of what everyone is working on and what impediments may be standing in their way of completing their tasks. We also hold regular 1-on-1 meetings where we can talk about personal goals, challenges, and accomplishments. This one goes both ways. A team needs to be able to trust their manager, and a manager needs to be able to trust their team. One of IMPACT’s core values is Dependability, and that feeds directly into our trust in one another. If you hire the right people for the job, your communication is strong, and everyone knows what’s expected of them, it shouldn’t be hard to trust that your team will get things done in a productive manner. There’s so much more value to seeing my team in person than there is in a video chat. We make sure our remote employees periodically make their way into the office, so everyone can spend quality time with each other. When we’re unable to make that happen, we’ll schedule video lunches, have after-work phone calls about life, and engage in social media and group conversations to keep the strong bonds we’ve create. Take a deeper look into the 7 tips Nutcache has laid out in their infographic below.